I have done so many draughts of this dress and have finally honed it to perfection. Again, it is VERY easy to make. There are just two pieces to sew together, a couple of darts and a tuck at the front. There are step by step instructions here that you can print out onto A4 paper. It looks good in a linen for a summer style, or really beautiful in a silk for an evening look. (I also have plans to make it in denim next – watch this space.) This soft tulip shape is very this season and really comfortable and easy to wear. I love the slight bubble hem and it is surprisingly flattering – although I would cut it a bit shorter if you are smaller me (5ft 8). It’s made here in a very soft and slightly silky fabric (probably viscose) from John Lewis. If you used something like a cotton instead you would find that the tulip shape was much stronger. Have a look here at my other version to see how it would work. I am just working on some step-by-step instructions at the moment. But, to be honest, I think it is fairly self explanatory: Cut out your 2 pieces, draw on the darts in chalk then sew them in place. Sew in the tuck and the front an iron in place. Finally sew the front and back together. Hem. Easy peasy! I have made another version of this dress with some changes if you fancy an alternative. 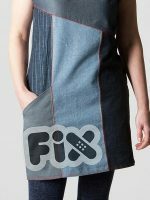 Have a look at the post Tulip dress with colour block to see details of this red and grey version. 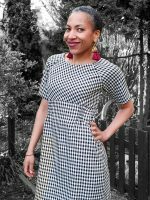 Have a look at this lovely version of the Tulip Dress from A-line Sewciety. 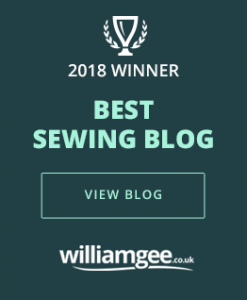 This is a fabulous post with plenty of info about how to adjust the pattern to fit your body shape and a particularly helpful tip on extending the front pleat if it bags out at the front too much for your taste. She is fuelled by Strawberry Margaritas as she sews – maybe this is the way forward! hey, i really like your patterns, I would really like to sew some of them. But i don’t know how to print them. Is there an istruction? I can just open one page, ist that normal? Yes, there are instructions on the pattern itself for how to have your print settings. I guess they are not much use there. I will move them to be more visible. Yes, it just opens one large page in a PDF format. If this is not clear please let me know. I can see what the problem is. It is important that the pattern opens up in Acrobat. Some new browsers will open the pattern for you automaticly but you won’t be able to change the print settings to print out full size. So, if it doesn’t open in Acrobat, download you pattern, then open it yourself through Acrobat. Chose PRINT. Look for Page scaling and change the setting to Tile large pages. Set the Tile scale to 100% and the Overlap to 0 . Then Print. It prints out on pieces of A4 paper like tiles – you stick it together to make a full size pattern. Just click on the orange link to open the PDF. Press print – make sure that in your print dialogue box you select scale: 100% or make sure that you DO NOT have fit to page selected. I love your website and would love to make a number of your items, however, I can’t get the pattern to print! I seem to have the same problem as above postings. I ask for the pattern to be printed and all I get is 1 page which has the entire dress pieces on it (ie for Barbie!) Please can you help! I have changed everything since I realised so many people were getting the same problem. But you’re right – that link had slipped through the net. I’ve just sorted it out. It will take you to a different page with a link that works now. Hello… what size is this dress? Its a UK size 12. There instructions about how to alter it to another size on the making a pattern fit page. Hi Laura, I have printed out the pattern and got it all taped together , now I want to make a size 18 and I read the you need to add 12cm along the seam lines . so would you add 6cm right around the whole pattern or just in different parts , ?? Love this pattern (& the parisienne top) but how much fabric would I need? I can’t seem to see that written down anywhere – or am I just not looking properly? I’m afraid this was one of my very early top before I realised I should have been taking note of how much fabric it needed. I just can’t remember – sorry. I absolutely love your patterns and find that you and I have a very similar style aesthetic. We also seem to be the same size. Goody for me!! Quick questions…I am US RTW size 12. Are your patterns as well? Also, I don’t see a mention on patterns about SA, are they included and if so, what size? Thank you in advance for your help! 1. For pieces 1-2 and 2-2 (back sleeve), do I match up the sleeve lines end-to-end, or do I match up the double lines to the right which causes the sleeve lines to overlap? 2. For pieces 3-2, 3-3, and 3-4 (center front) there are no double fold lines. Am I supposed to extend the center cutting line from 3-1 all the way to the bottom? Or do I somehow attach the center-front pieces to the double lines on the sides of 2-1 thru 2-4? I hope, hope, hope this makes sense. Thanks. Hi Carol – You need to look at the overview page (first page) to see how the pieces go together. There is a double line at the centre front, it just isn’t on the pieces you’ve listed. If it help, use the numbering – it goes first line of pages horizontally from left to right: 1,1 2,1 3,1 4,1 5,1 then onto the next horizontal line, 1,2 2,2 3,2 etc. And yes, do line up the lines end-to-end. Yes, thats right Monica. Happy sewing! On the FRONT pattern piece, from the yellow dot to the centre fold line it should measure 32cm. If it doesn’t you are probably not printing it out at 100% – check your scale in the print box. Love the tulip dress! I’ll have to alter it to a size 10. Does this mean I have to change the position of the front center fold and the darts? Also I’m not really sure if I have to make it smaller all along the side: from the tip of the sleeve all the way down to the hem? Hi Ellis, I’ve emailed you a drawing of where to change the pattern. 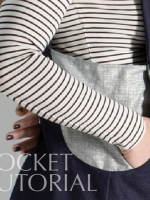 I’ve tried to find whether I need to add a seam allowance to the pattern but can’t find any mention of this. Please would you let me know whether it is included in the pattern or not. 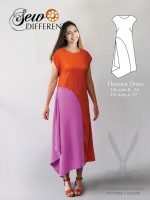 Hi Julia – there is no seam allowance on my free patterns. Printed the instructions. But can’t find the pattern. Hi. I love the pattern of this dress but I find that when I have a continuous sleeve, the dress becomes a little uncomfortable every time I raise my arm even a little bit. The sleeves bunch up around the arm and block my movement. 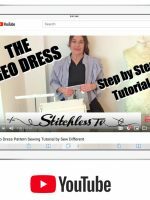 Do you have an alternate pattern for a sleeveless version or even one with sleeves cut out and attached separately? It would be great if you could share some modifications. Hi Juhita, Yes this was a problem with the initial version of this design. However, I am just launching the multisize version of a similar pattern (same name) with these issues sorted out. It will be available on paper or to download in 10 sizes, but unfortunately will no longer be free. Great – I’m so glad to hear when people use the plus sizes. 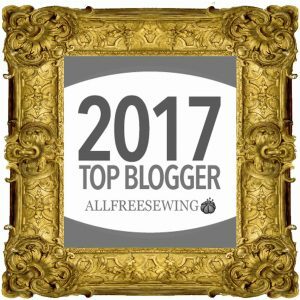 It is something that I spend extra money and time on because I feel it is important to make sewing accessible to everyone. So beautiful and it look pretty and it make sewing accessible to everyone.